I managed to sew the binding onto the front of the Happy Hour Quilt. Now I just need to hand sew it to the back. This one is going to my mom once it's complete. I still need a name for this quilt though. Any suggestions? 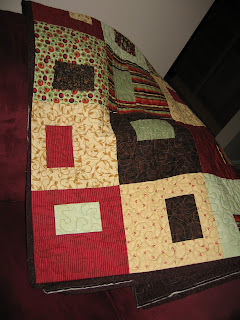 Here's a link to a picture of the whole quilt. And here are all three sets. If you use your imagination, you might be able to picture the transition in your head. I finished the July BOM today. I'm officially all caught up now!!! Here it is. Isn't it cute? Here are the two of them together so that you ca see how they go together. I'm so excited, I'm taking my sister to the Billy Joel/Elton John Face 2 Face concert tomorrow night as her graduation present. I completed step one of the McCall's Mystery Quilt tonight. I had already made the star blocks, but I needed to make the rectangular blocks. Here's one of the finished block. I'm making it mostly out of blues and yellows with hints of reds and greens. The examples shown have been a bit more random, but I wanted to be a little more uniform. We'll see if it pays off when the quilt is complete. Here are all of the blocks. Step two is already out, so I still have some catching up to do, but I'l get there eventually. I got two more BOMs done today. I started the May one yesterday, but it had a ton of pieces for a 7" block, so it ended up getting finished today. I really love this block. The picture really doesn't do this one justice. I also got the June BOM done today. I ended up feeling ambitious after I finished the May one and moved right onto the June one. I enjoy this one as well, but it's just hard to beat that May one above. So I finally have my quilting room back. 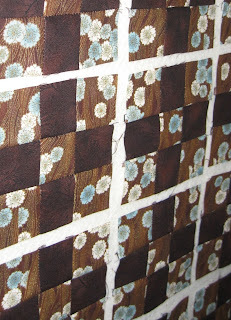 So of course, I had to do some quilting today. 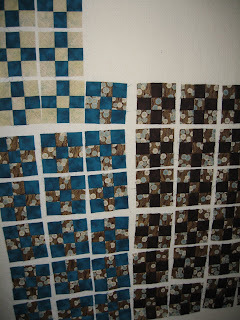 I have a lot of catching up to do with all of the time I haven't been able to quilt with the move and our house guests. I tried to find some fabric that had the feel of rain for "April Showers" and this Hoffman print in the setting triangles was the closest print that I could find. Here's all of the scenic BOMs together up on my design wall. I also worked on piecing some of the McCall's Mystery Quilt, but didn't get very far on that because I have a lot of work to do around the house and stuff. So my quilting room is being inhabited right now by one of my sister-in-laws. My in-laws are staying with us for the week, up from Georgia. As a result, my sewing table and all my stuff has been pushed to the side, so I can't really do too much right now. I did, however pull a few things out so that I can cut things on the dining room table. I'm cutting the fabric for a blooming nine-patch that I'm going to make for my cousin's wedding next May. Here's the fabric that I'm using. I've never been big into Asian fabric, but I fell in love with the top fabric and I know it's totally going to fit my cousin and his fiance. 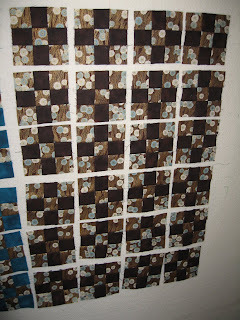 I also opened up a Swanky honey bun from Moda and began organizing the strips so that I can make an Irish Chain quilt that I saw using honey buns on the Moda Bake Shop blog. My 6 year old sister-in-law (my husband is the oldest of 6) was helping me pick the color combinations. How cute.